Rugby Town travel to Stourport this evening (Thursday, March 22) to kick-off a punishing schedule, which will see them play eight MFL games in just 20 days. In their last outing – which represented manager Dave Stringer’s 250th in charge at the club – Valley were easily beaten 4-0 at current league leaders Coleshill to end their run of two successive victories. It was a miserable day all round for the Town boss, with driving snow and the bitterly cold temperatures making the dugout area a particularly unpleasant place to be, whilst there were also reports of a post-match fracas after Rugby recorded their twelfth defeat of the MFL campaign. Of these twelve losses to-date, last Saturday’s was one of only three that have seen Town lose out by more than a single goal though – with the same score-line at the Coleshill’s fellow divisional frontrunners Bromsgrove and a 3-1 Boxing Day reverse at Shepshed the others. Coleshill success over Valley and their subsequent win at Bromsgrove on Tuesday evening has seen them leapfrog Sporting to establish a two point lead over their main rival, with Worcester, Khalsa and Highgate now a distant third, fourth and fifth respectively. Tonight’s opponents Swifts sit down in 16th place in the table, although having only completed 26 league games so far this season after a decent run in the FA Vase competition, they are still playing catch-up on the fixture front. The two sides met in the reverse match at Butlin Road at the beginning of September, with Town twice coming from behind to win by three goals to two – with James Dance, Ben Ashby and Josh Ruff on target for the home side. 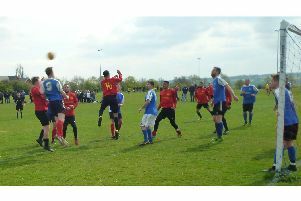 Rugby’s last trip to Walshes Meadow saw them suffer a 3-0 defeat in the Southern League Western Division in February 2004 – one of six games between the clubs in the early years of the 2000’s. Valley are back at home this Saturday with a game against another team who have little to play for this season, when Westfields visit Butlin Road for the first time. In the only other competitive fixture against the Hereford-based outfit, Town secured an FA Cup Preliminary win in August 2014 thanks to goals from David Kolodynski and Seb Lake-Gaskin, although Fields – who were formed in 1966 – did go on to have a particularly successful FA Cup journey two years later when they reached the First Round Proper of the competition, before losing in a replay against Curzon Ashton. With such a busy schedule over the coming few weeks, Stringer may look to boost his squad numbers ahead of tomorrow’s transfer deadline, especially after another of his roster – Isaac Cooper – recently left to join fellow MFL Premier team Quorn. The left-sided Cooper only started three times for Rugby after signing from Hinckley, with all three games ending in defeat as part of a miserable February which in effect snuffed out any chance of Town making a late bid for one of the two promotion places available. Valley’s third match of the week sees them travel to Shawbury United next Wednesday (28th). Goals from Ruff and Ruben Wiggins-Thomas gave them victory over the struggling Ludlow-based club earlier in the season, and United’s latest defeat at the weekend at Worcester left them in 21st place. # The club coach to Stourport will leave Butlin Road at 4.30 p.m. and the Shawbury one next Wednesday at 4 p.m. For latest information on these, contact Tony Mann on 07970 691366.